Some students who are blind or visually impaired will be able to access information by simply using the internal magnification built in to the computer. Other students will require additional amounts of magnification or screen reading software to access information. You can make simple modifications to the computer display by accessing the “Accessibility Options” in the Control Panel. The pointer can be enlarged, the blink rate can be slowed down, the curser can be enlarged and the icons can be made larger. Also, the computer monitor can often be tilted to reduce visual glare. If this is not possible, a shield can be constructed and placed at the top of the monitor to reduce glare. 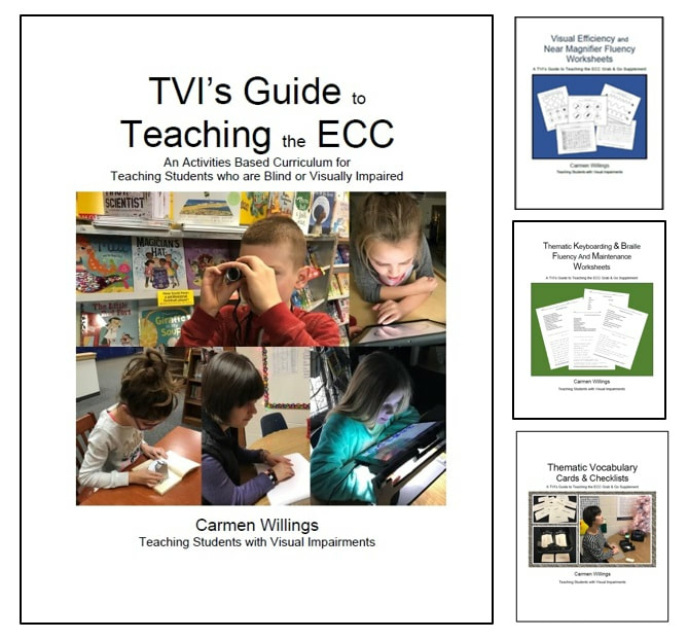 These simple computer modifications, however, do not meet the needs of all students with visual impairments. The accessibility features do not modify programs, games and the internet, but only modify information within a word document and on the start up page. For students with low vision, you may consider purchasing a screen magnification program. Other students will need a screen reader program or one that has both features. 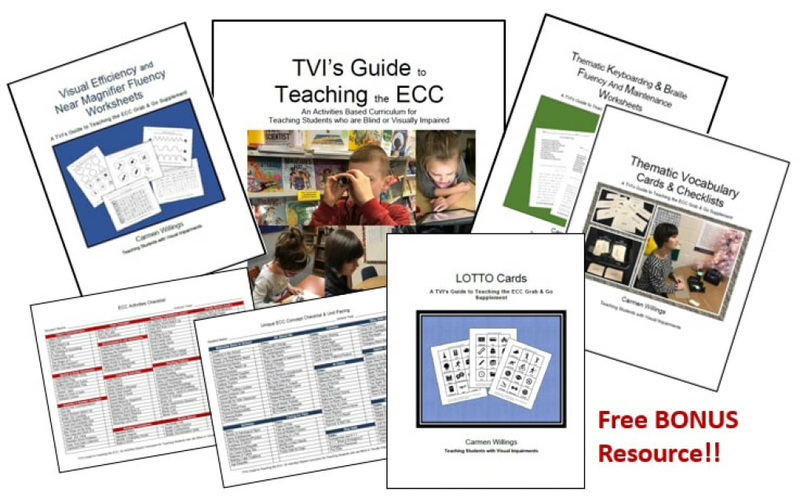 The TVI or assistive technology specialist can help you locate and obtain an appropriate program for the student. 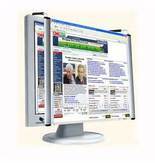 A screen magnifiers can be purchased to fit on your current monitor. They can magnify up to 1.5X the original source. This is OK for students who only need minimal screen enlargement. Be cautious as some overlays can create a warped look to the edges of the computer screen. For students who need more magnification, screen enlargement software would be a more appropriate choice. Screen enlargement software allow for the magnification of the computer screen so the screen can be easily read and allow the student to see whatever is on the monitor. For those who have very poor eyesight, talking software is available that can read the text on the page. The best option for students who are blind who will be required to take computer tests or complete other projects on the computer, is for the school to purchase a screen reading software program. Screen reading software, like JAWS, reads the information on the computer screen. Students who will use screen readers need to be instructed in how to: load software; turn voice on/off; make adjustments (speed, pitch, volume); navigate within a document; read (by characters, words, lines, sentences and paragraphs); and access the help file/manual to troubleshoot. CDesk by AdaptiveVoice is a stand-alone, all-inclusive software program designed for individuals who are blind or visually impaired. CDesk is a single program with fourteen core applications, built from the ground up to be extremely intuitive, simple to use, and easy to learn by utilizing a consistent user interface. "Peggy" is the speech recognition system that allows a totally hands free user experience. Visit the AdaptiveVoice website for more information. ​JAWS® is a screen reader, developed for computer users whose vision loss prevents them from seeing screen content. JAWS reads aloud what's on the PC screen and gives the user a unique set of intelligent tools for navigating and accesses Web pages and all screen content. NVDA software enables people who are blind and vision impaired to use a computer by communicating what is on the screen using a synthetic voice or braille. It is totally FREE, yet fully functional and portable. You can download it to your PC, or to portable media such as a USB stick. ​Serotek believes accessibility is a universal right, and with that mindset, they work to ensure their products help you get the most of any computer. 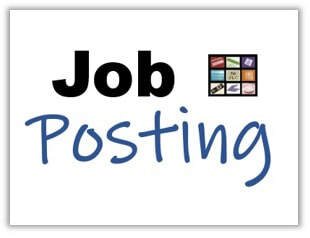 They advertise that their solutions are affordable, convenient and easy-to-use. ​TalkButton is new text-to-speech assistive technology now available for a free trial download. Developed especially for use in Microsoft Word documents on Mac computers, TalkButton allows you to read, work and create right in Word, while you listen. Its unique automatic scrolling feature lets you read along easily, highlighting spoken text word-by-word, or line-by-line. TalkButton also reads text from email, web browsers and programs like Pages, Preview, pdfs and Text Edit. It's very user-friendly, fast and responsive, quickly customized with one-click changes and shortcut keys. TalkButton uses high quality voices in multiple languages. Thunder is award-winning screenreader talking software designed for people with little or no sight. According to their website, it works well with Windows 7, Vista or XP. It is available all over the world in several languages and it is FREE. ​Virtual Magnifying Glass is a FREE, open source, cross-platform screen magnification tool. It is simple, customizable, and easy-to-use. WebAnywhere is a FREE web-based screen reader for the web. It requires no special software to be installed and enables people who are blind to access the web from any computer that has a sound card. ​Window-Eyes screen reader by GW Micro is now FREE for download for people who are blind, visually impaired, or print disabled who have a licensed version of Office 2010 or later!